Info: Created on 29th September 2011 . Last edited on 11th December 2017. @thalamic - Beautiful design, and wonderful execution. Love those blocks! With such a delicious touch of Art Nouveau ... I detect the experienced creative mind with social ability, sharing ideas to stimulate our own experiments. A novel serifcomp entry by a skilled Fontstructor. Sorry that this got so long. Thanks for the appreciation. @Aeolien: Skill is the easy part; figuring out what to do takes perseverance. I wish I can say that like a true artist, I could see the result before the letters emerged, but the reality is that it started with just a basic idea and evolved into what it is now. Thank you for appreciating my meager effort. Yes, we would have loved this hi-res 'font' in the 1980s! In trying to figure out kerning pairs to test, it got confusing fast. So I wrote a small Excel macro to determine them all. 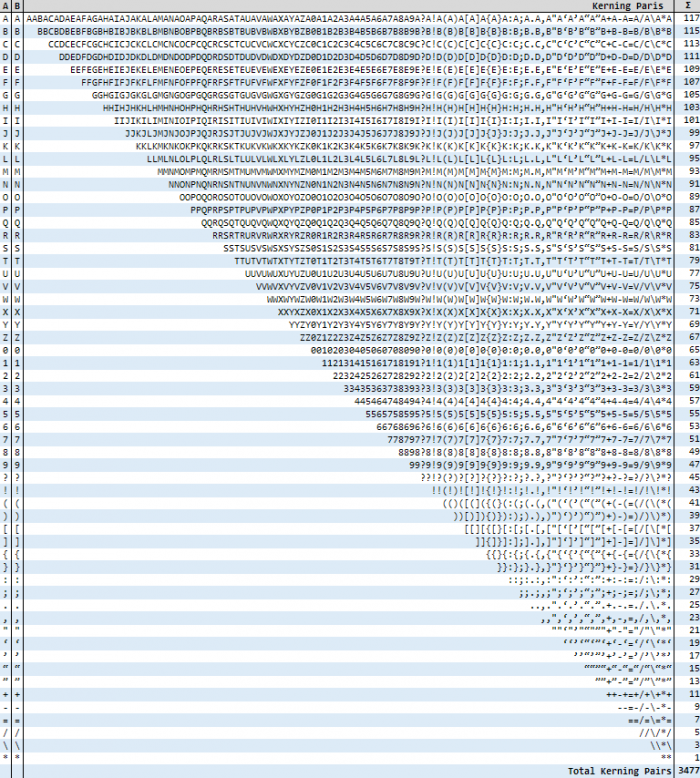 For a combination of 59 glyphs, it turns out 3477 kerning pairs must be checked. Yikes! I've done maybe a 1000. Thanks, Goatmeal and dpla. I don't know if I got them right or wrong, but I checked over 4000 kerning pairs. Your kerning pairs are impressive! Congratulations! FontStruct Staff have deemed your FontStruction worthy of special mention. “tm Almost” is now a Top Pick. Very elegant font with a nice and delicate gray value. I would appreciate an extended glyph set. That would be great. A very beautiful design with lovely shapes. Just "wow" regarding the kerning, that many pairs? Sounds like total madness to me so maybe there should be a second TP for the pairs ;) Congratulations! im confused at what this font does, but it looks pretty cool!